Not all of the sneakers prove to be a good walking shoe and not all walking shoes can be considered as good sneakers, right? You must find a comfortable, well-designed, durable, comfy pair of shoe that caters to your walking needs without troubling you. So you need to find a solution for both of your needs? Look for the walking shoes like TIOSEBON walking shoe discussed below. TIOSEBON women’s Athletic walking shoes prove to be a combination of features you need in a walking shoe a work shoe, and a sneaker as well. The reason behind this multipurpose shoe is to provide the user with the best walking experience without having a need of any other shoe at all. This walking shoe is unique in many ways. The overall design is like a soft sneaker whereas it offers support and comfort like a walking shoe. So the materials are used in combination to offer the features you need in both kinds of shoes. You will feel the comfort as if you are wearing on your sneaker and the inner sole will provide support and cushioning like a standard walking shoe for athletes. The basic materials used in the making of this shoe is textile and rubber. These materials offer durability, comfort, and style in one go so that you can enjoy your walk without fatigue and pain in your feet. The materials also resist early wear-tear problems for better performance and lasting use. The upper of the shoe is made up of durable, flexible textile that offers a breathable surface for consistent and reasonable air-flow. This helps in keeping the foot dry and cool to avoid major skin problems due to sweat. The outsole is also a combination of features assure better grip on the ground no matter if you are walking on a smooth surface or on rough ground. It is made up of a soft, flexible and durable rubber that offers a strong grip on the ground and support the shoe in an easy manner. The comfortable construction and the materials make the shoe easy to wear and offer 0.5 wider space for accommodating wider feet easy inside the shoe. The thick and durable rubber sole assure better grip as well as keep the foot safe from shock, high-impact and pointed objects on the ground making it feel safe and comfortable on the inside. Since it is simple and comfortable, the shoe can be used in all seasons and for all occasions no matter if you wear it as a casual shoe or for going out, it serves the best in all conditions and on all occasions. There is a Pigskin insole featuring damping latex insert that assures to reduce the impact on the foot and provide enough arch support to sustain the natural foot posture. In addition to that, the Comfort Dry liner offers to cushion and a drier feeling inside the shoe. The Solyte Midsole offers lightweight and durable support that reduced the pressure and offer increased power to let the wearer feel easy and comfy while wearing the shoe. Does TIOSEBON women shoe offer a comfortable fit? Yes, the shoe is comfortable for both wide and narrow feet due to the flexible upper that accommodates the foot as a sock does. Can we wear these in both hot and cold climatic conditions? 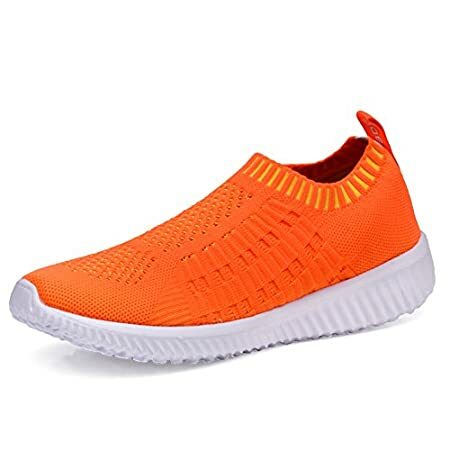 Since these are airy shoes, they can be used in hot regions and due to their flexible textile fit, wearing them colder regions is also easy and suitable enough without any issues. Are these shoe slip resistant? Since the outsole is made up of thick, anti-slip rubber we can say that it offers slip-free performance no matter where you walk. Yes, this is a lightweight shoe that offers support and allows better performance on the ground. Are these shoes durable and lasting? It is definitely easy to say that the shoe offers lasting materials and make sure to avoid wear and tear issues. Does the shoe offer sweat free inner? With the help of the mesh upper and the sock-liner inside the shoe stays cool and dry no matter for how long you wear it on in warmer regions as well. Can we expect a wide toe box or not? Since it offers a flexible design, the wide toe box is there to offer reasonable fitting for bulkier feet as well. The shoes turn out to be the best seller in the walking shoe and sneaker category since it offers a range of features and benefits that allow people easier fit and wearing process and make sure they feel comfortable and safe while walking on the ground. The customers who have used and tried the shoe have already shown their trust on these by giving them around 4.5 out of 5 points rating online. This show that the shoe has a reliable and trusted performance features that anyone can rely on it without any problems. Overall the TIOSEBON women shoe comes with the features that assure, comfort, quality and support, and long lasting performance. The user can wear it on easily just like a slip-on shoe and enjoy the snug-fit design to walk easily on the ground without facing any issues. The fabric upper and flexible rubber outsole make sure to offer an easier fit no matter if you have a wider foot and need some more inner shoe space. With an airy design, the shoe is suitable for a range of climatic conditions for staying easy and relaxed during the walk.